It’s been ten years since I first visited New Zealand on a solo backpacking adventure. I thought it was a once in a life time opportunity. Little did I know I would end up married to a New Zealander and return more than five times since that initial trip. The one place I like to return to time and time again, is Rotorua. Though I haven’t had the chance to go tramping in New Zealand again, my New Zealand bucket list is always growing but Rotorua is my favourite destination. It’s such a diverse little place in terms of sites and experiences! I was really looking forward to returning to Rotorua with kids. Especially now that our 3.5 year old remembers everything. There is something to enjoy for everyone in the family. From the geothermal wonderlands, to many adventure activities and cultural experiences, it is always a jam packed few days. Only a three hour road trip from Auckland, it’s the ideal distance for a weekend away. Or for international tourists, it can be incorporated into a longer North Island adventure. We visited for four nights to ensure we could fit in as much as possible. Rotorua is also within close proximity to many other major tourist attractions such as Lake Taupo, Huka Falls, the Waitomo Cave and Hobitton! In the past we have used it as a base to bring our tourist friends to the surrounding area. 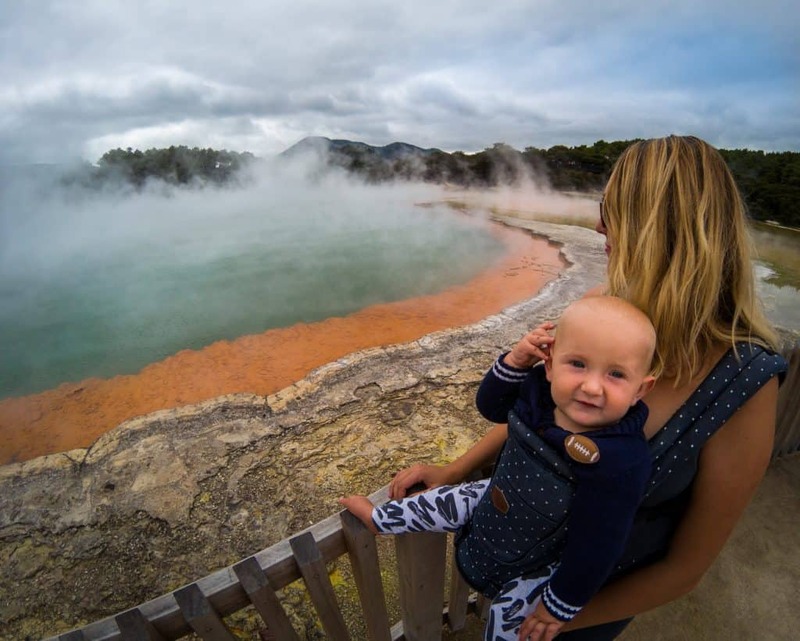 Here is our guide to Rotorua with kids. I have to confess the Skyline adventures is one of the things that brings me back to Rotorua time and time again. I am a luge addict! If you don’t know what that is, think mountain, Mario carts and downhill winding pathways through forest! Its literally the best fun. Ok, I admit, I may get a little competitive with it, but Esme loved winning against daddy. The only way to the top of the hill where the track starts, is by gondola. There is a nice restaurant at the top. We literally spent the entire morning and afternoon up there. In between our rides, we had lunch before taking another ride back down to the bottom. There are three different tracks. The scenic, intermediate and advanced. I had our 3yo with me in my cart so we stuck to the intermediate. She loved it! When we visited, we had the grandparents with us. They kindly minded our little ones whilst we had one last adrenaline kick. We did the zip line together. Its pretty awesome and definitely one of the fastest I’ve been on. The mini bungee at the end is a super cool surprise part of the course. There are several lakes in the Rotorua area, three of them are side by side about 11kms out of town. They are so beautiful with the crystal clear waters, fern trees all around the edges and stunning mountains in the distance. We visited all three of them on the Rotorua Duck Tour. Our favourite was The Blue Lake! The colour was stunning and it was so clean. Our tour guide told us the water is also drinkable which is quite impressive. The tour is one of those truck come boats that picks you up in the centre of Rotorua. It’s a really fun and interactive afternoon for the little ones. It’s fully guided and they give everyone ‘duck’ whistles which was a hilarious touch and really engaged the kids. 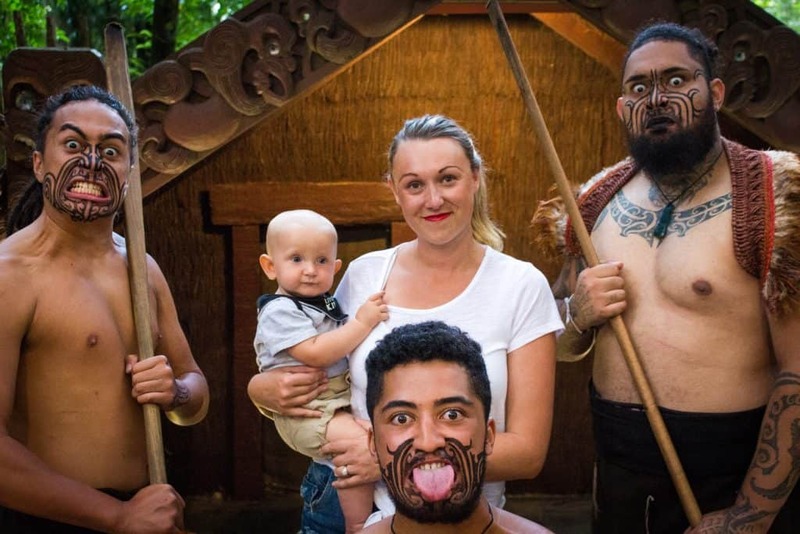 When we visited Rotorua previously we went to a different Maori village. However it really doesn’t have a patch on Tamaki Maori Village experience. I can not explain how awesome its set up. We did the 6pm experience. Its in a beautiful forest setting where visitors get a really good feel of what a village was like back in the day. We saw lots of demonstrations of the haka, games the Maori ancestors use to play, as well as a ‘hangi’. A ‘hangi’ is a traditional way of cooking food in the ground. A method used by the Maori’s many years ago. After our time seeing all of the demonstrations, we were brought to the dining room where we were served the most amazing hangi meal. My inlaws, who are New Zealanders said it was the best one they have ever had. Our three year old loved everything about it. She was dancing and joining in at any opportunity. I have visited so many of the geothermal parks in Rotorua, but none of them are as impressive as Wai O Tapu! There is a geyser close to the entrance that spurts into the sky every morning at around 10/1030 am. The colours and size of Wai O Tapu is what really sets it apart from others. Especially the massive steaming lake with orange rim and aqua green centre. They call it the artists palette. The walk around is really easy but its best to bring little ones in a carrier for ease with steps. There is plenty more to see aside from the lake, like craters and bubbling mud. Just ten minutes away from Wai O Tapu is Kerosene Creek. Hidden behind what looks like a fern jungle is a steaming hot river. Its heated by the geothermal activity underneath the bed of the river and is one of the nicest most relaxing places to hang out. It’s completely free but I am sure one day it will be made into a proper attraction. There are not many spas that allow children to enter. We learnt that the hard way on our first trip back when Esme was a baby. Luckily, Hells Gate is very welcoming of families. 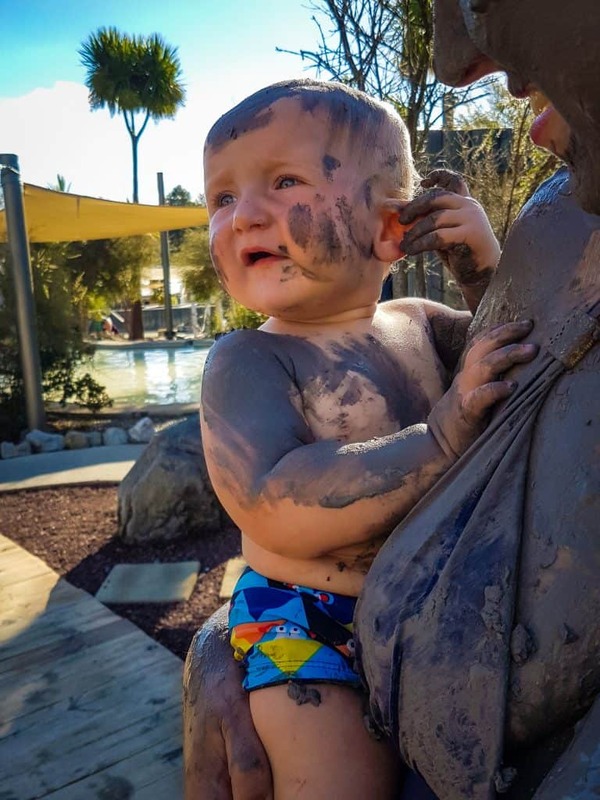 The spa is the only one in Rotorua that has a mud pool! 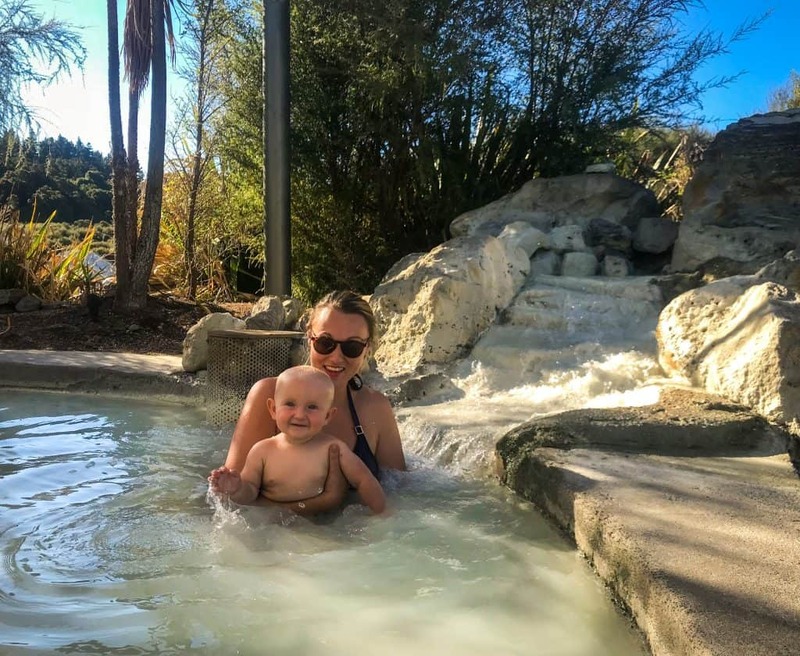 They allow little ones over six months into the ordinary spa pool, and those over three years into the mud. We tried everything including the mud and cold plunge pool. Our skin felt amazing afterwards. It was such a relaxing experience. You can read more about Hell’s Gate here. 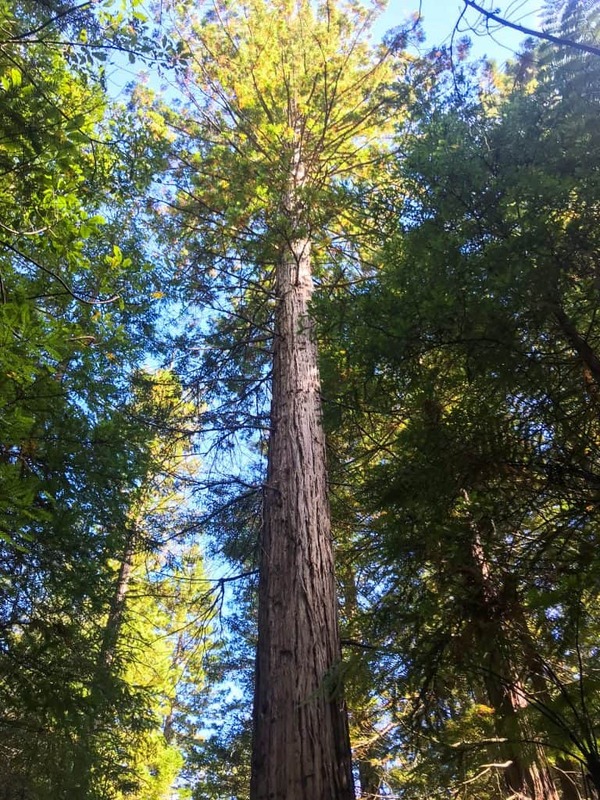 The Redwoods in Rotorua will never beat the ones we saw in California! They are very big and impressive but there is not very many of them. That said, they have a very special feature in the evenings. A lit up walkway weaves in and around the redwoods high in the sky. It’s absolutely gorgeous! Something worth noting is kids need to be able to walk by themselves. The walkway is like a tree top canopy so babies in carriers or little ones needing carrying can’t go on the walk. Another great rainy day activity is the 3D Trick Art Gallery. There are around 50 displays of 2D images. Visitors can get as interactive and involved as they like to make the most of it. The idea is the pictures become 3D on a camera. It was really cool and well thought out in terms of a guide on ‘how to do it’. They had foot prints on the floor showing where to stand. Many of the pictures were New Zealand themed, like the rugby and Maori images. Our baby really loved the space section, whilst our 3yo loved sitting ‘Inside’ the snow globe. When we go to Rotorua, I love staying in a house rental. Its like a home away from home and they are always so cozy! 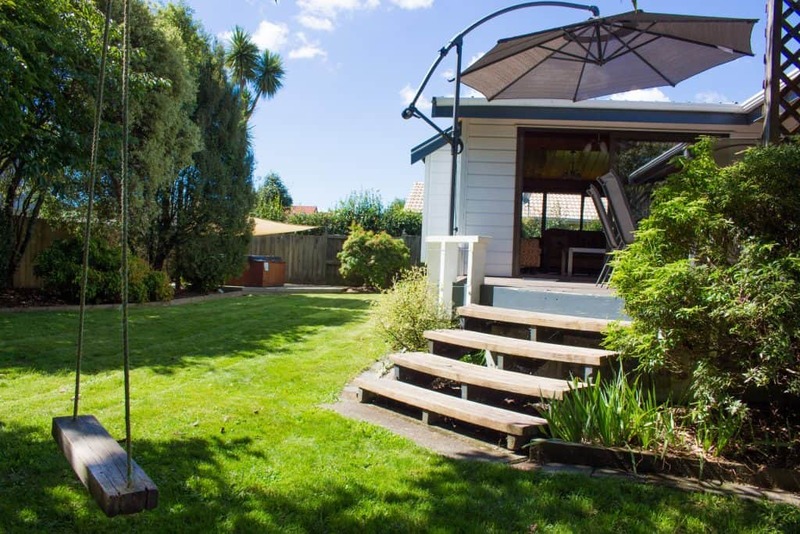 We used the local website Rotorua Retreats to book a gorgeous four bedroom place! Just minutes from downtown Rotorua was our secluded Orchard Retreat. Complete with a tree swing, spa pool, open plan living and a huge deck, it was the perfect relaxed space for our family. Esme had two sets of bunk beds in her room, whilst there were three other large doubles, one had an ensuite. We really loved the house and the kids had ample space to play and crawl around. Ordinarily, we can make lots of restaurant recommendations but we found we just wanted to stay at our place at every opportunity. We had dinner and lunch there every evening, either sitting in the garden or inside if it was a little cooler. 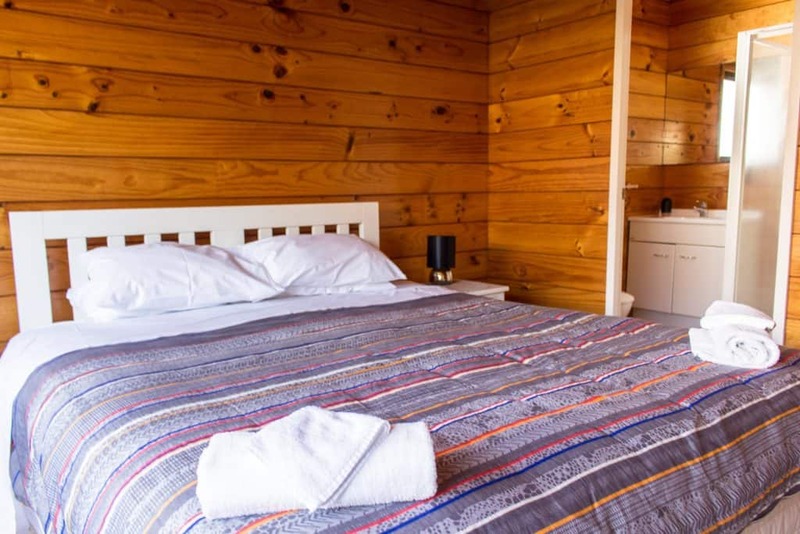 If you are looking for a nice place to stay, make sure to get in contact with Rotorua Retreats. All up Rotorua will be a place we will come back to time and time again. We love it so much and have made amazing memories there. I feel four days is a good period of time for a one off trip. Are you visiting New Zealand any time soon? Maybe you already live here and fancy a weekend away? 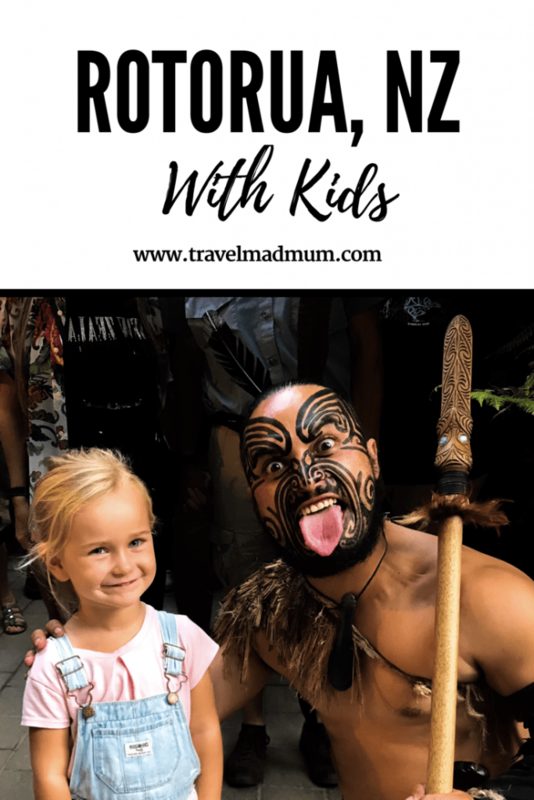 I have teamed up with several amazing partners to give one family a trip to our favourite place in all of New Zealand – Rotorua! As you can see above, Rotorua is a geothermal wonderland with some of the most jaw dropping landscapes. Not to mention it is one of New Zealand’s adventure hubs! A two night stay in Rose Lake Cottage. Gifted from the wonderful Rotorua Retreats. 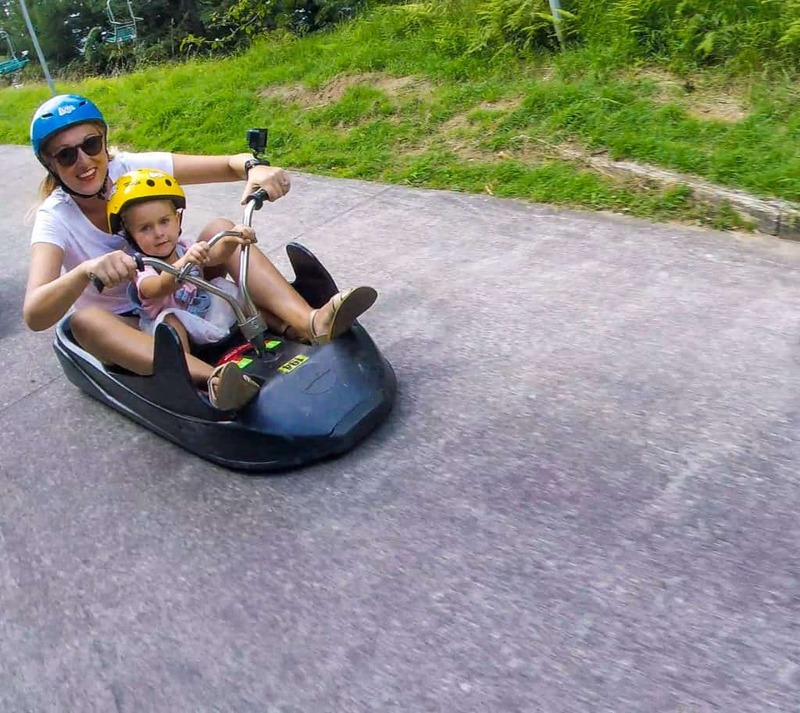 A family gondola pass and 6 luge rides. An evening at the Tamaki Maori Village, experiencing cultural performances and a delicious Hangi dinner with the family. 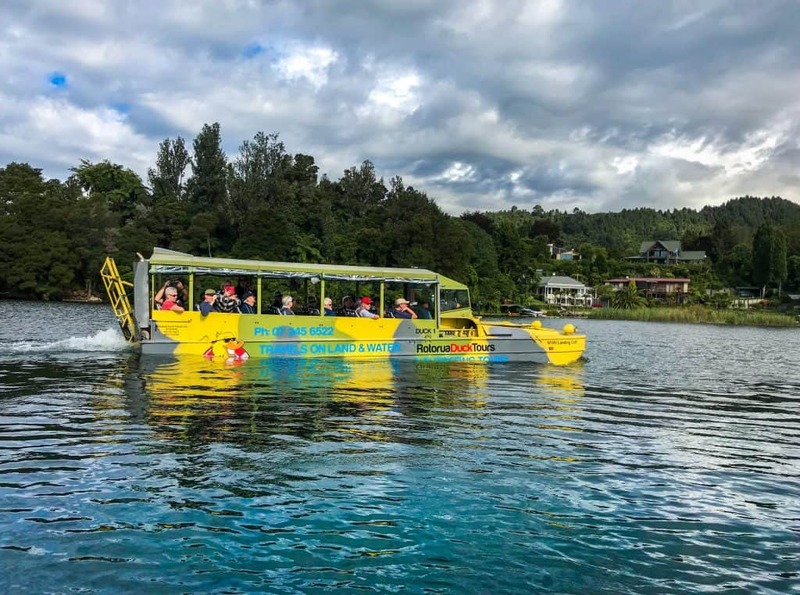 Ride on three of Rotorua’s pristine lakes and see the beauty of the area on a fully guided tour with Rotorua Duck Tours! Utilise the gifted pass from Hells Gate to walk around their geothermal park and take a dip in the mud spa afterwards. Your skin will feel great! Total value $1605 based on two adults and two children. Subscribe to our email list in the form below. Keep an eye for our upcoming social posts to get an extra chance to win. Winner will be announced Easter Sunday, the 1st of April. 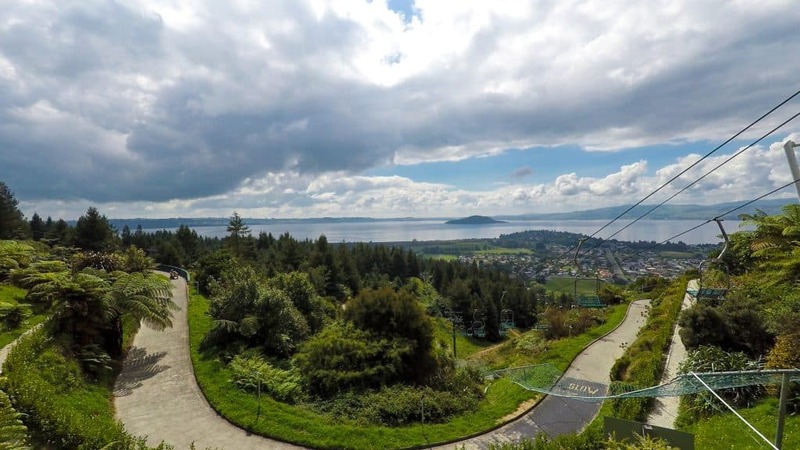 Have you found Rotorua with kids helpful? Leave a comment we love to hear from you. If we’ve helped you in some way, we would love if you could help us too. In this digital age there is a demand for immediate information online. Being a patron is a new-age way of giving a small token of appreciation for this information, which takes time to put together. We offer exclusive access to blog posts before they are published as a thank you. We also offer travel advice and consultancy at different payment tiers. You can sign up to our Patron program here. 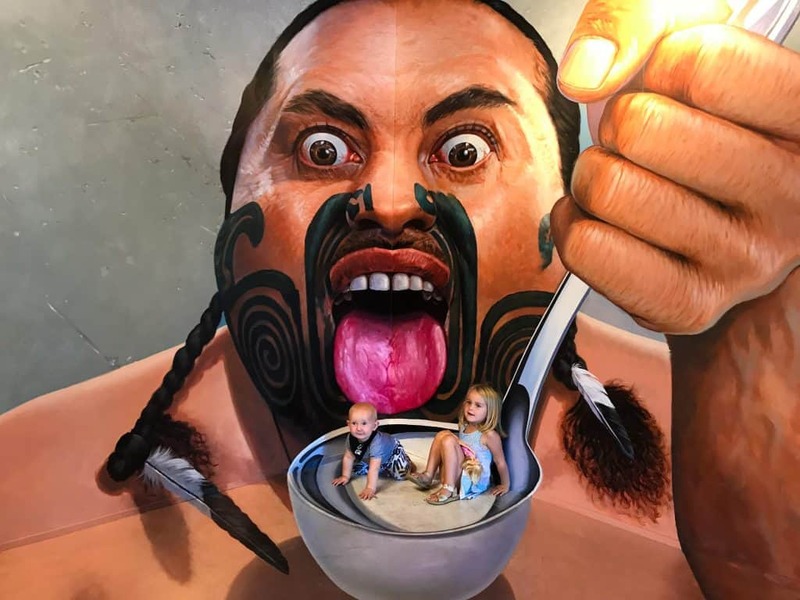 Disclaimer: This post, Rotorua with kids, has affiliate links. Some of our stay was complimentary in return for an honest review. As always all views expressed our entirely my own. Great post…thanks for the tips! We’re from the UK and taking a road trip round the North Island in May. After reading this I realise we need to add a few extra days in Rotorua! Can’t wait to explore this amazing country! Amazing post, looking to come to NZ in January and can’t wait to do all of these amazing things! Great post! We’re from Chile, we arrived on April 5 and definitely have to go to Rotorua, thanks to you for the tips and I can’t wait to get to know this place! We will be competing to win the stay, It would be a beautiful experience! I appreciate your sharing. In my point of view Rotorua is an interesting place for visit especially for kids. I also spent a really good time there with my uncle’s family during my last summer holidays and came back with great memories.